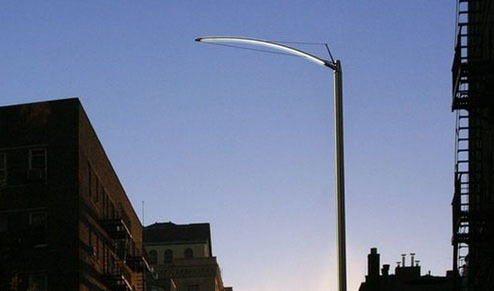 New York City will begin testing new LED powered street lights starting tomorrow in a pilot project that may result in all 300,000 sodium based street lights being replaced with the more energy efficient LED ones. LED lighting has advanced significantly over the last few years. They are not only only great for lighting up your geeky looking computer case but are now bright enough and efficient enough to use as everyday lighting. Audi has even incorporated LEDs into its headlights on its R8 sports car for its day time running lights and has plans to introduce it to other new models starting next year. Georgetown, a small town in Ontario is also testing LED based lighting. Unlike New York City, Georgetown has opted to test LED lights on its pathway systems by building three separate test zones. Each zone will be individually metered so town officials can calculate the energy savings. The first zone will be lit entirely with LED pathway lights, the second zone will be a mix of LED and traditional lighting and the third zone will be lit with traditional lighting alone. The three zones will provide actual field test results on how effective the LED lighting is, and how compatible it is with traditional pathway lighting systems. While NYC is much larger than Georgetown, it is conducting a far smaller test by only installing 6 LED street lights. City officials have not determined where the new lights will be installed for testing, nor have they committed to switching to LED based street lights after the tests are complete. The bulbs themselves for this $1.175 million contract are being designed by Lighting Science Group and the company expects that for each pole and light source that is replaced, the payback period for the city will be two to three years. Not only will the city reduce its power usage 25 to 30 percent, but the bulbs will last 50,000 to 70,000 hours. Today’s sodium lamps are rated at 24,000 hours, which means at that point half of them are dead. The testing involves more than just swapping the old bulbs with LED bulbs. The city will be testing new light poles that have a new sleek design that has built in channels for hanging accessories like street signs, flags, flower baskets, etc. The light poles can also hold multiple lenses to direct the light into various places. For example, 75% of the light can be directed to the street while 25% is directed to illuminate the sidewalk.